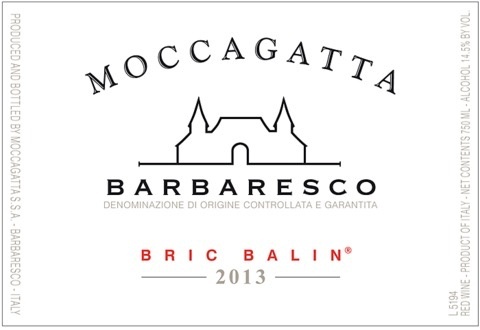 Wine Moccagatta Barbaresco Bric Balin 2013 - Royal Wine Merchants - Happy to Offer! 94 Points Antonio Galloni “A deep, sensual wine, the 2013 Barbaresco Bric Balin is shaping up to be a real jewel. Hints of orange peel, mint, spices and white pepper make an appearance on a bouquet that is full of intrigue. The 2013 is deep, powerful and structured. Like all of these wines, the Bric Balin is likely to need at least a few years to start showing all it's got, but there is plenty to look forward to.” The vineyards of Moccagatta, located in the town of Barbaresco, have been in the Minuto family since the second half of 1800, when it came under the ownership of proprietor and patriarch Giovanni Minuto. Giovanni’s son, Luigi, began turning his family’s harvest into wine in 1913 before passing down his life’s work to his sons, Lorenzo and Mario, in the early 50’s. A family affair to this very day, Moccagatta continues to focus on both the terroir of their homeland and the finesse that Barbaresco demands. The vineyards are all farmed organically and the wines, while being aged in a stunningly updated winery, speak of a place and of a people with a long history of tending this very land. If you haven’t been introduced to the wines of Moccagatta, now’s the time. And if you have, we welcome you to reacquaint yourself with these beautiful wines from Barbaresco.